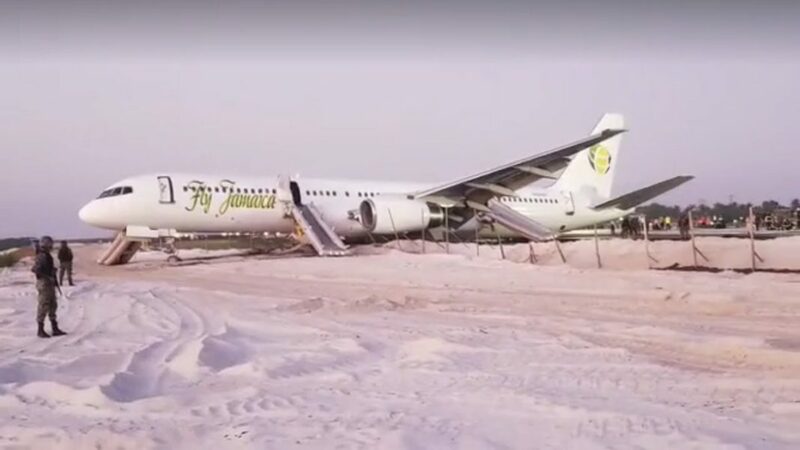 Six people were injured after a Boeing 757 with more than 120 people on board crash-landed at Guyana’s Georgetown airport, officials said. The aircraft was en route to Canada. Less than 20 minutes after takeoff, the Toronto-bound jet had to change course and return to the departure airport due to mid-air malfunction. The crew noticed a problem with the hydraulic system and was forced to turn the aircraft back to Cheddi Jagan Airport. However, the emergency landing resulted in a crash, as the Boeing 757 overran the runway and hit a barrier. The incident led to the brief closure of the airport, but it has now been reopened, according to local media. Dramatic photos have been circulating on social media showing the crash site. One of the aircraft’s turbines is seen badly damaged after it apparently slammed into a fence. Six of the 128 people aboard the plane, including the crew, suffered non-life-threatening injuries, the minister of public infrastructure, David Patterson, said as cited by local media. The aircraft is 19 years old, according to Flight Alerts. The incident comes shortly after a Boeing 737 MAX 8 – the company’s state-of-the-art jet – crashed in Indonesia, killing all 189 people on board.